Iranian dissident writer Akbar Ganji has been placed in solitary confinement after being transferred back to prison from hospital, his wife has said. 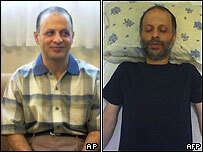 But Iran's judiciary later denied the claim, adding he was in "very good" health and was sharing a cell. Mr Ganji, jailed in 2000 for writing articles in which he linked senior officials to the murder of dissidents, went on a hunger strike in June. He resumed eating after allegedly being told he would be sent home. But according to Massoumeh Shafii, his wife, he has now been put "in quarantine" for no apparent reason. In an open letter published by the reformist website Emruz, she said there was no medical reason to keep him isolated from other prisoners. She branded the decision "a two-way news quarantine or a political news blackout". Ms Shafii, who has not been allowed to visit her husband for 18 days, said the decision to take him back to prison "went against some judicial officials' negotiations and agreements with Mr Ganji". But Iranian Justice Minister Jamal Karimirad on Tuesday told journalists Mr Ganji had been returned to prison and was in a shared cell. "His health condition is very good," he added. Ganji ended his hunger strike last month while in hospital. Ganji's lawyer, the Nobel prize-winner Shirin Ebadi, has said her client's release on parole is long overdue since he has already served almost all his six-year term. Iran: Who holds the power?